Spring has sprung here at Lake Rudolph! Now, who’s ready to go camping?! In honor of Oreo’s 100th Birthday today (Happy Birthday!!) I thought we’d feature S’moreos, a delightful and yummy variation of s’mores. Remove graham cracker, add Oreo and viola! Split Oreos in half. Divide the chocolate bar into equal pieces just like you would for normal s’mores. Toast your marshmallow over the campfire (or if it’s not camping season yet you can use the microwave). Place the toasted marshmallow on the Oreo cookie half. 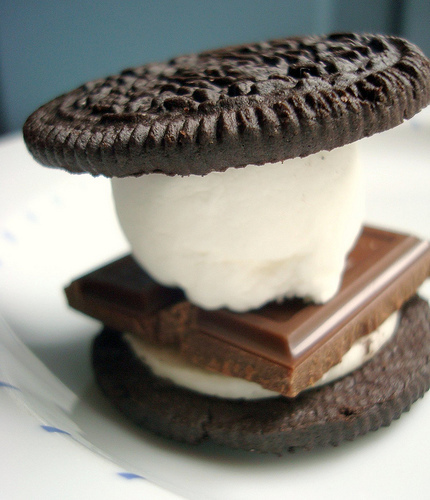 Top with chocolate and finish with the other half of the Oreo. Yum! – Recipe courtesy of CakeSpy.com.